Siva Kugathas (43), of Sutton, spent 20 years working in senior franchise roles, for both Pizza Hut and KFC in both the UK and Europe before choosing to invest in the Guildford-based, commercial cleaning franchise, ServiceMaster Clean Contract Services (CS Guildford). Siva was responsible for creating KFC’s UK Operations Service Manual and achieved the Restaurant Manager of the Year award in 1997. CS Guildford currently turns over £138,000 and employs 30 staff but Siva aims to double this size of the company and his over the next 18 months. 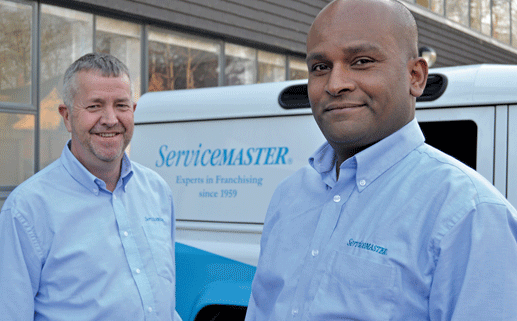 The company provides daily office and commercial cleaning services to businesses across the region and is part of the ServiceMaster franchise network, which has been trading in the UK since 1959. CS Guildford was founded in 1992 and is part of a national network of 68 licensed office cleaning businesses.